Look, do you want to know why there are so few decent jobs and everything costs more? First, stop blaming the banks! I don't care if you've watched a program, including your favorite news show, read a book, or whatever—you're wrong! I have seldom met a liberal, or conservative, for that matter, that understands how their government or economy actually works, let alone the Federal Reserve Banking system. But, that doesn't stop the endless opinions, based primarily on simple left vs. right slogans picked up through peoples preferred media sources. I was involved in the banking industry, and the prime and sub-prime mortgage business as well, both as an investor and as a broker. Did the banks help precipitate our current financial predicament? Absolutely! But, the real source of the problem was the government, both on the Left and the Right. In particular, it was the Clinton administration. Unfortunately, the Republicans weren't much better. The banks simply did what savvy investors always do, they followed the money trail. And, they're still doing exactly that. Why? Because they're not stupid! If you're going to demand that people lend to unqualified applicants, as they did in the housing boom and bust, you're going to get some serious financial blowback—especially if the government is going to guarantee a substantial portion of those bad loans through government subsidies. Whatever you subsidize, you get more of, that is a simple economic truth. And, we got a lot of very bad loans as the result, causing the market to crash. We're still living with the aftershock and will for a long time to come. "So, how did all this bad investment happen?" For more than a half century government created institutions like FHA, Fannie Mae and Freddie Mac helped secure home loans for people with reasonable credit and modest, but sufficient incomes. It was only after politicians like then president Bill Clinton coerced banks into making loans to people with low credit scores that the problems really began. Once banks started lending to people without reasonable credit, sometimes without an ability to even verify that they had actual jobs, the whole system collapsed. Congress made their contribution by rewriting our laws, making it easier to finance a home with less collateral. And then, they made sure that every U.S. Citizen was on the hook for it. For a period of time it created an economic boom. The following bust, however, set in motion a tsunami of debt, threatening to wipe out everything in it's path, on a near global basis. That isn't a banking problem—banks don't have the kind of authority necessary to change laws, only government does. Yes, there were all those esoteric financial instruments created by Wall Street wizards that were intended to maximize profits while minimizing the concurrent destruction. What did our governmental leaders expect! If you chum the water and the sharks churn it blood-red, no one should be suprised! This is, after all, what sharks do. Remove the chum and the sharks disappear. The residual chum-line, however, could easily be traced directly to it's source; the Washington establishment, Barney Frank, Bill Clinton, George W. Bush, Alan Greenspan, Ben Bernanke and other would-be Jonahs, searching furiously for the magic whale that could boost the failing economy. And, by the way, the same exact logic, or lack thereof, is at work in the debate over raising wages. Government can't raise wages for average citizens, it can only mandate that those working at the minimum wage get paid more. In other words, this only applies if you already have a job. In a labor market where the demand for workers is diminishing, raising wages on cash-strapped mom and pop businesses will only create more unemployment. Some people will get paid more, others will lose what they have—and they'll find it harder to get a job once they're out of work. But, as long as you frame the debate in terms of billionaires vs. the poor you can get a lot of traction, almost all of which comes from folks who have no idea how an economy actually works. Most workers aren't employed by billion-dollar corporations, they work for small businesses and are increasingly self-employed. Meaning; you can't lay the burden on Walmart and McDonald’s without seriously harming the vast majority of actual workers and their struggling employers. So much for the good intentions of ill-informed people. 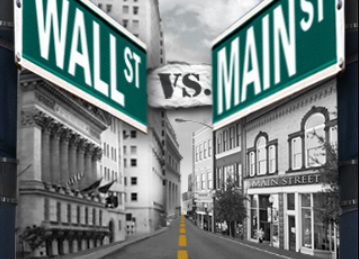 "Why then, are so many Wall Street firms rolling in dough as compared to mainstreet?" If you print egregious amounts of money, as the Federal Reserve has in the past, and continues to do, and then lend it to Fed member banks so they can make auto, credit card, home loans, etc., they will still need a substantial number of credit-worthy people to lend to. And, there are increasingly fewer people that meet that criteria. Banks like Goldman Sachs and other major players are just about the only ones who can readily turn a buck, moving money around and manipulating the market like so many grand masters at a Chess board. That's why Wall Street is awash in filthy lucre, while the average Joe can barely pay his bills. If you determine to lend to folks without reasonable credit and business acumen (which the government is still attempting to do) you'll just recreate the previous boom and bust cycle all over again, expanding the recession exponentially. You will, not surprisingly, hurt the very people you intend to help. "But, didn't these money-grubbing leeches create the whole problem to begin with? And, didn't they need to be bailed out by the government in the end? The answer; refer back to the first part of this article and reread carefully." No one, and I mean no one with a functioning brain wave pattern, is suggesting that these moneyed interests aren't partly to blame, they certainly are! They needed the government to write the necessary laws in order to rob from the poor and give to the rich, namely themselves. It is the collusion of the two that is the real problem. The Federal Reserve can legally print money, manipulating the flow of dollars to create an artificial economic boom. It can also choke off the money supply by raising interest rates and throw the nation into recession. That is, by definition, a centrally-planned economy, with banks and government in partnership. It is anything but a free economy. Did the government intentionally create the problem? Does it matter? In the long run, it doesn't! The outcome, whether intentional, or merely the byproduct of someone's poorly-considered policies, has left all Americans with the same result, a broken economy and massive debt. How much debt? Americans pay more in taxes and regulatory costs than they do in food, transportation and healthcare combined. And, it's going to get worse. So, the next time some politician suggests “Just give us more regulatory power over the financial markets.” remember, they are the same people who made this whole debacle happen in the first place. If we do something as simple as get the government out of the “business” of business, you'll have a better, more free economy—free from the real culprits that started it all to begin with. Only a fool keeps doing the same thing over and over again while expecting different results. If you really want a change, think outside the box. If you don't, you very well might find yourself living in one—under some nice freeway—with all the time in the world to contemplate your mistake.